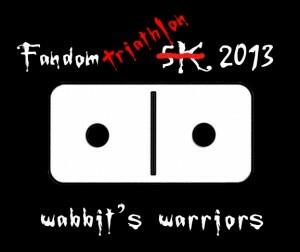 In 2011, dragonfly_sg1 and I went crazy one night and started fandom5k, a community to help ourselves and our fellow sci-fi fans get in better shape. It was a simple enough thing. We set a goal to run a 5K and hopefully raise some money for charity in the process. That same year, I ran my first 5K ever. It was not a charity 5K, and me being new to such things, I did not raise any money for charity on my own. I did, however, make a donation to Shriner's Hospital for Children just for myself. That led to another fan doing the same, and though it was small time, my 2011 Fandom 5K was a success - especially since I'm not much of a runner and I made my (albeit conservative) goal time. In 2012, I ran a Warrior Dash, an obstacle course 5K with my sister-in-law, and I raised $500 for St Jude. This was beyond every expectation I had, and I was thrilled! I made my goal time then, too, despite running with a partner for the first time ever and again setting a conservative goal. Fandom 5K used to be a small but fairly active community. Now, it is pretty much a ghost town. A few of the runners there still chat via other venues, but it has mostly fallen into that strange internet land of wind and ghosts where things are largely forgotten. Between that and my own life throwing me some curves, I had essentially given up on doing anything for Fandom 5K this year. But lo and behold my work schedule just dramatically changed and I fell hard again for Being Human, and that has given me some motivation to do something crazy again. I realize that those two things might see drastically unrelated, but they very much are not. See, I'd been toying with another obstacle 5K or something even more...extreme...earlier this year. The biggest idea banging around in my head was a sprint triathlon right down the road from my house. Sprint triathlons cover all the tri bases of swimming, running, and biking, but go shorter distances than the typical tris. I thought *maybe* I could do it, but between work and other things, I convinced myself it wasn't an option. That I *couldn't* do it. Well, then rediscovering Being Human and falling hard for Hal Yorke led me to look up the actor who plays him, Damien Molony. And guess what? Damien recently completed his first triathlon and raised money for charity while doing so. And if he can do it, I can do it. The race I'm doing is local, and it's 250m of swimming, then 16 miles of biking, then 3.1 miles of running. And it's only three and a half weeks away. I will do this bright and early on October 20. Yes, I'm insane to consider this, I know. But I'm swimming far more than that at least twice a week these days, so that I can handle. The biking concerns me quite a lot, and that's where my training will be focused beginning today (did 8 miles this morning, in fact), and I've got to hopefully rustle up a road bike somewhere, but if not I'll ride my mountain bike - it's not like I'm doing this to be competitive time-wise. The running? Well, I haven't run in ages, but that has always been something I can change pretty quickly. So, we shall see how this crazy adventure goes. I'm not setting a time goal (though I have a vague idea in mind) because I've never done a tri before. But no matter what, I'm all in. The things fandoms accomplish that have little to do with fandom are my very favorite part of fandom, and, well, I'm all in. My charity this year is Doctors Without Borders, and my fundraising page is here. I'm doing this on my own, and I chose this charity because fandom has obliterated borders for me, and frankly I think the world is a better place without them. So I wanted something international (and with a good charity ranking) that I could believe in. I believe in Doctors Without Borders, and to those brave souls who do their work, I send nothing but respect. So donate if you can, and if you can't, send me messages of support, will you? I think I might need them. I'll also take all the GIFs, images, and other lovelies anyone wants to send, of course. *winks* I've already started us off by donating to myself. It's the least I can do. For those of you not into Being Human (and shame on you first of all) here's one picture that tells the story of my design. There are others, but I chose this one for the discipline it implies. Because I'll need some of that on this little journey. 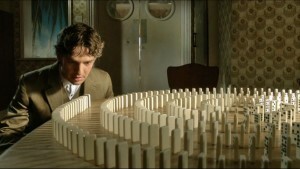 Fortunately, I'm usually pretty well-endowed in that department - but dear Hal helps a lot. p.s.-there may be some other goodies coming soon, too, but that's another story for another night. Yes, there's more. Everyone donating $10 or more gets a surprise personalized, wabbit-designed button. I've got several designs, and you'll get the one that most makes me think of you. I've got Firefly, Stargate, Star Wars, and a very special red design for any Being Human types out there. More are likely on the way, if my brain does its usual thing with this and goes crazy with ideas. Oh, but I'm having fun with this! That seems completely reasonable. Why would I mind? I just want to raise some money for charity and maybe have some fun and better myself in the process. Oh, holy carp! Deal! You're totally on! DM/email/whatever me your address! I might have it around here somewhere, but that will be easier. Will totally donate but must wait until after Oct 1. There is a half triathlon held here and my neighborhood is the staging/transition area but there is no way I would even consider it so I say GO YOU! No problem, my dear! I'll be sure to remind you. I swim/bike/run on Oct 20, so we've got plenty of time!